You may or may not have noticed that this Nag took some unannounced, yet very grateful, gratitude-filled days off. The truth is I was finding my nagging to be not only a drag and a drain, but it was driving my practice, instead of the other way around. I was practicing to Nag. Ewwwww. This is not good. This is an awful admission. But it is true. And it was becoming apparent even in my posts. From the beginning into my Yoga Nag world, I knew that nagging was good encouragement for my own practice. I couldn’t exactly nag others to practice if I wasn’t practicing as well. It had partly selfish intentions. Yet, it was different. My practice would lead me to something I wanted to share, some nugget of wisdom that had landed, whether a pose, an action in my body, a thought, a struggle, work in progress, a thread of something making sense for the first time or a reminder of something I already knew. Then I would take a picture, trying to capture a piece of what I was doing, and in this process, I hoped I would encourage others to practice. Yet, something somewhere changed. It happened slowly, camera eking into my practice earlier and earlier. It is a no brainer that this isn’t good for your practice. Yet, there I was, multi-tasking, practicing, nagging, and even working out lesson plans all at the same time. I got a little lost. I am not against visuals or pictures of yoga. Obviously. I love them. But if those visuals become the focus of the practice, e.g., the practice becomes a photo shoot, and the deep dive into yourself and breathing in this moment, yes, this one, right here and right now, then, well, the photos are getting in the way. So, I am working my way back to basics, creating a separation of church (my practice) and state (YogaNag.com). I haven’t figured it all out yet. But I am shining the light of my awareness, as well as my intention, on recalibrating. 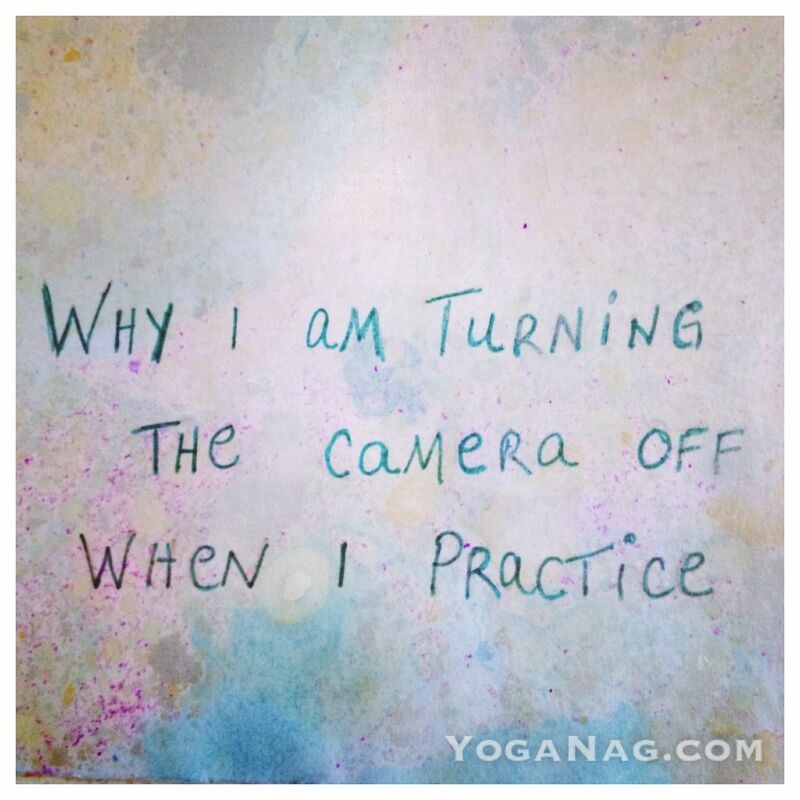 Leaving the camera off during my entire practice is an easy step. Duh. I know. Yet, I don’t think I am alone in needing to do this…. Then, later, after I have practiced, I can strike a pose that captures what I am feeling or working on. This is my commitment to myself and to you. Continuing on… Camera off. I practice. First. For me. For my body. For my heart. For my mind. For my soul. And then, I share some small part of that practice with all of you, in my very small hope and wish that it encourages you to practice. For your body. For your heart. For your mind. For your soul. This entry was posted in Blogs, Do Yoga. Today. Everyday. and tagged no camera, no photos, practice, Yoga. Self-awarenesss is hard — you’ve outlined a good compromise.